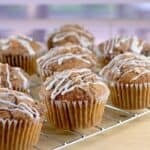 Caramel Pecan Coffee Cake Muffins, with all the goodness and joy of a fresh, made-from-scratch muffin, but no dairy and only 240 calories each. With stats like these, we can have our coffee cake and eat it too. Cream together the butter, oil, and sugars. Add in the creamer and almond milk. With the mixer running, add the eggs one at a time. Stir in the pecans. Separately, combine the flour, cinnamon, baking powder, baking soda, and salt. Add to the wet ingredients to form a batter. In a small bowl, use a fork or pastry cutter to combine the ingredients for the topping. Stick the bowl in the freezer for 5 minutes. While the topping is chilling in the freezer, line 12 muffin tins with papers. Spoon the batter into each, filling 3/4s full. Get the topping from the freezer. Use your fingers to drop little bits over top the batter in the muffin tins. Bake at 400F for 20 minutes. Move muffins to a wire rack to cool completely. Once cool, prepare the glaze by combining the confectioners sugar and creamer. Drizzle over muffins and serve. Yields: 12 muffins.